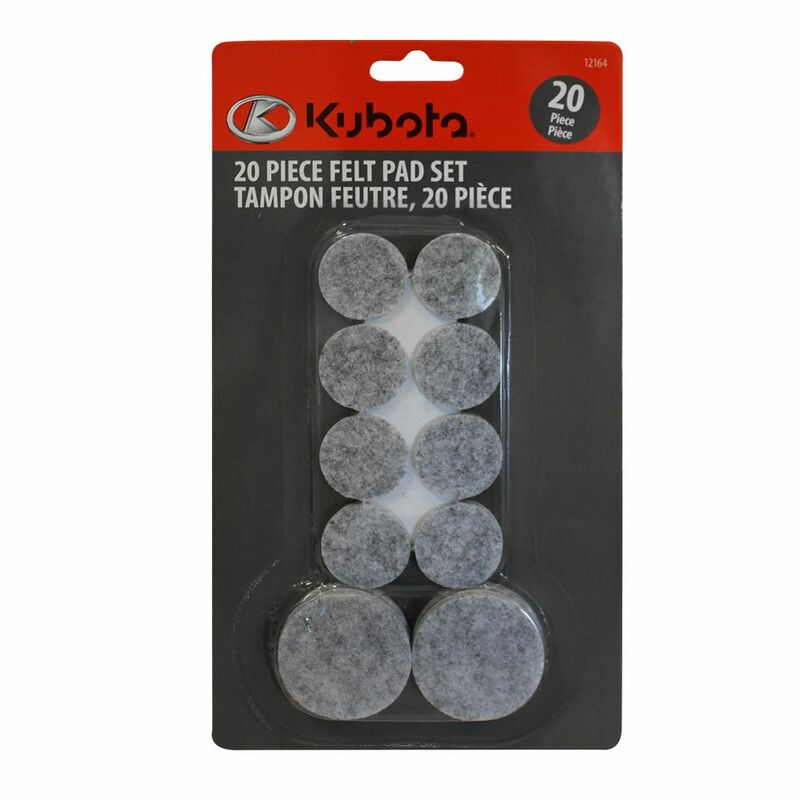 This Kubota 20pc Felt Pad Set is essential to protect flooring, table tops and furniture from scratches. Features quality felt and durable self-adhesive backing. Just peel and stick to create a non-scratch surface. These Furniture Sliders are designed for use on all non-abrasive floor surfaces and allow furniture or appliances to move smoothly over carpet, tile, and other surfaces. The glides are tan-colored and constructed of durable polyethylene. The glides are self-adhesive or they can be installed with the included screws. Choose this 108-piece value pack to protect your floors against scratches and dents with Assorted sizes of heavy duty self-adhesive felt pads. The 3-1/2 inch felt sliders quickly and easily slide furniture across hard surface floors. Use, then remove and store until needed againch The large size sliders are made with premium quality felt backed by durable foam for repeated use on hard surface floors. The clear self-adhesive bumpers are great for protecting surfaces and deadening sound on small appliances, home and office accessories, cabinet doors, and decorative items. This Modern Homes 200pc Felt Pad and Vinyl Bumper Set is essential to protect flooring, table tops and furniture from scratches. Features quality felt and durable self-adhesive backing. Just pick from the variety of shapes and sizes then peel and stick to create a non-scratch surface. These flat-free wheels are durable and designed for use in the most demanding environments. Puncture-free, no pressure loss and no flats. Please note that F21578 wheel size is 4.80/4.00-8. 20 pc Felt Pad Set This Kubota 20pc Felt Pad Set is essential to protect flooring, table tops and furniture from scratches. Features quality felt and durable self-adhesive backing. Just peel and stick to create a non-scratch surface.